Hassle-free page-building for beginners. Excellent. Following on from the wellreceived Webplus 9, the tenth instalment of Serif's DIY page-maker is about as puzzling and complicated to use as a glass of water. When you fire it up for the first time, the interface seems absolutely chocka with tools and options; however, a quick click of the Help tab, and the beginner is coddled to the point of nannying. If you're new to webpage building, Webplus 10 is pretty much the least intimidating design package you can buy. 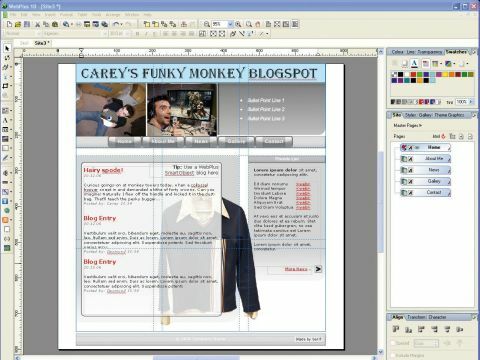 The package contains numerous walkthroughs for every stage of the process, and the program comes pre-loaded with a metric ton of templates for different kinds of websites; hobby pages, blogs, e-commerce sites, online photo galleries, and pretty much anything else your brain might cook up. So if you really can't be bothered to design something from scratch yourself, the framework is already there. Extensive support for e-commerce is another of the aces hidden up Webplus 10s wizardly sleeves, and it's a piece of the proverbial to link in common shopping-cart providers and secure payment methods such as PayPal. Editing existing pages is a cinch too, as you can easily import sites, complete with accompanying meta-data, server-side script, forms and so forth. So if you've already built a site using, say, your ISP's free-but-naff page-building software, Webplus 10 is a good environment in which to tart it up properly, give your online presence a distinctly professional air with the absolute minimum of fuss. All of which makes the package ideal for homespun business users, bloggers and recently converted dabblers alike. It's no Dreamweaver - but if you're already coding in HTML and know your CSS onions, you're probably using that already, and for you, Webplus 10 is going to be a step down from the versatility you're used to.